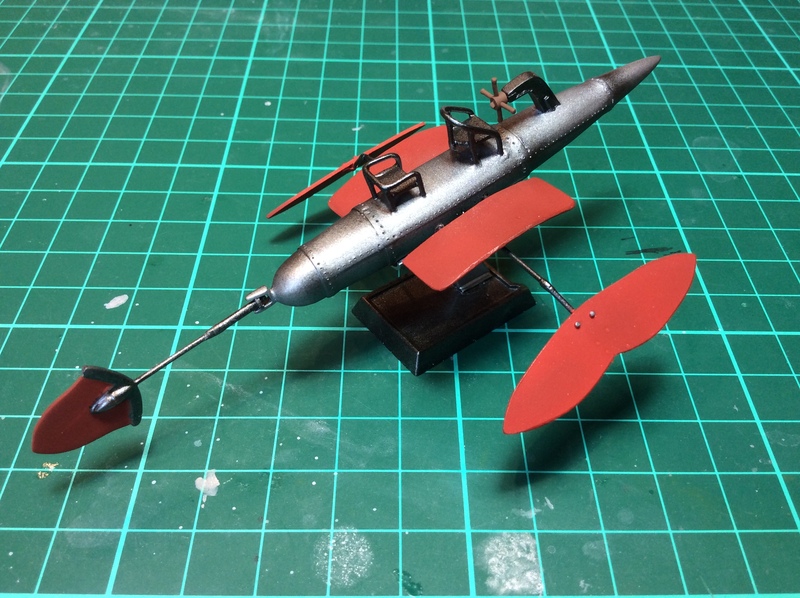 Hi all, I'm new to the forums, but I was inspired to join after stumbling upon andonio64's great scratchbuild of the pirate plane from Hayao Miyazaki's amazing animated film, Porco Rosso. After a bit of browsing around, I've seen a few familiar faces from other "WHIF/Fantasy" sites/forums and there seems to be a bit of cross-posting going on, so I felt empowered to do so as well. 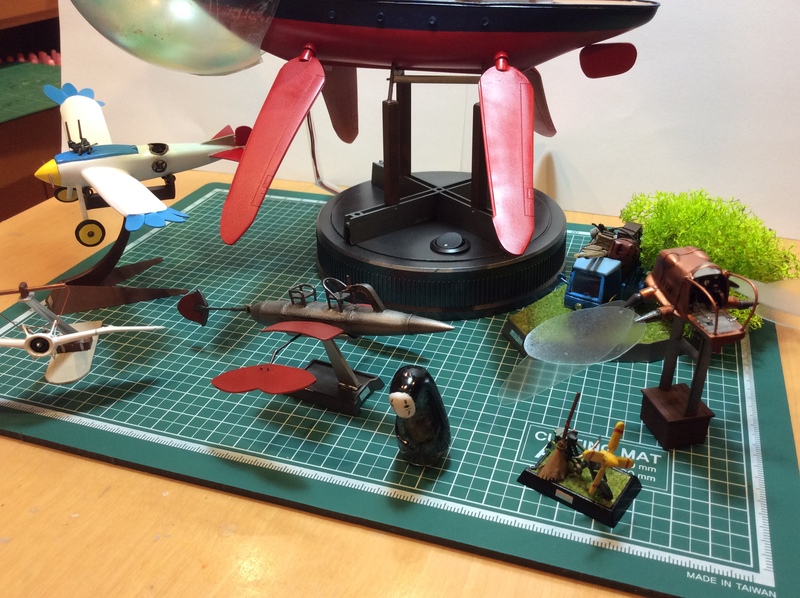 There's always a bit of a different crowd, and I thought this one might enjoy seeing my collection of Miyazaki mini-projects in 1/72 scale. I've adapted (and improved) some of the project elements based on feedback I've received elsewhere, so feel free to send any constructive criticism my way. 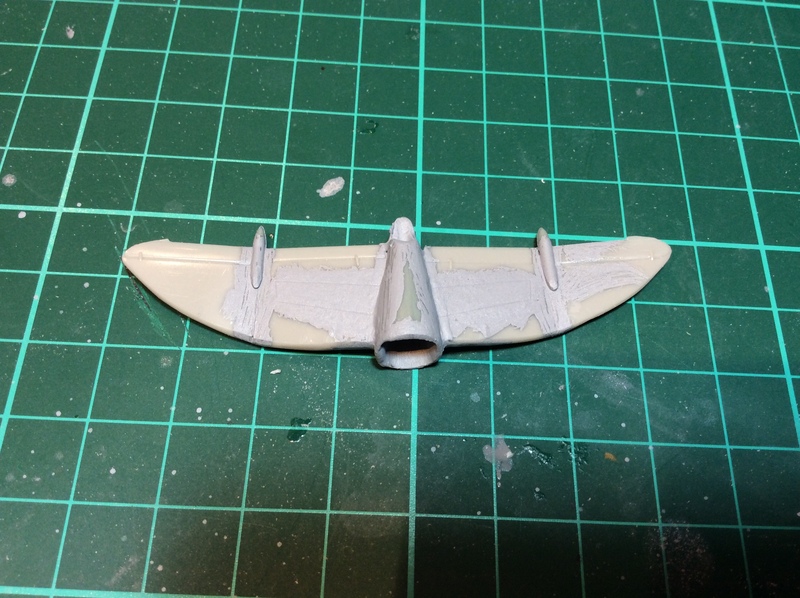 A Flaptter from Laputa: Castle in the Sky - primarily from a cut up 1/72 Spad XIII fuselage married to the underside of a 1/100 Me162 Komet. 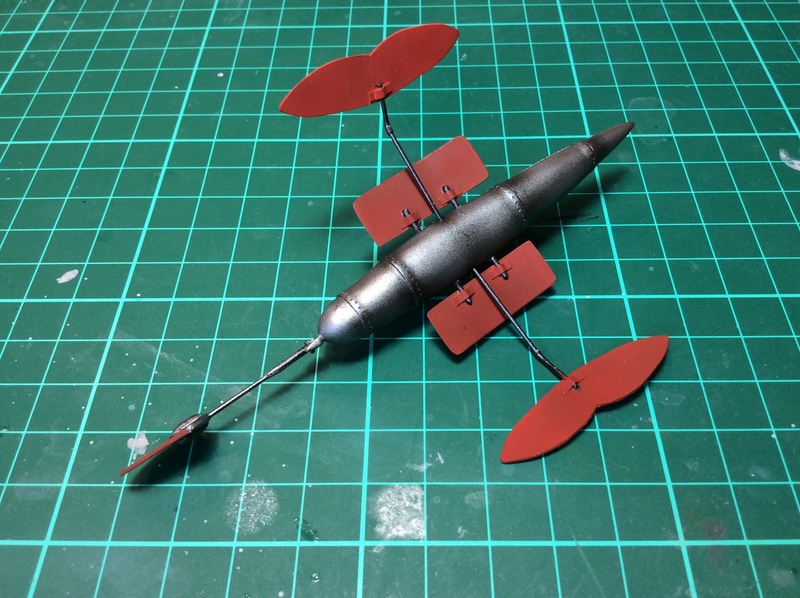 The propeller bike (and a flying broom) from Kiki's Delivery Service - basically from scratch, but using some bits (and wheels) from that same Spad XIII kit. 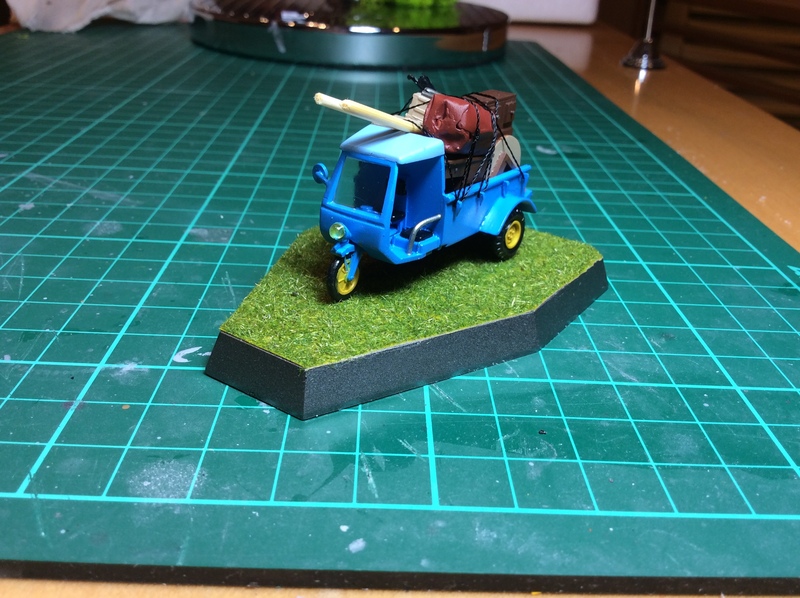 The three-wheeled "mini truck" from My Neighbour Totoro - using parts of a 1/72 Willis Jeep, a Kübelwagen and a Kettenkrad. 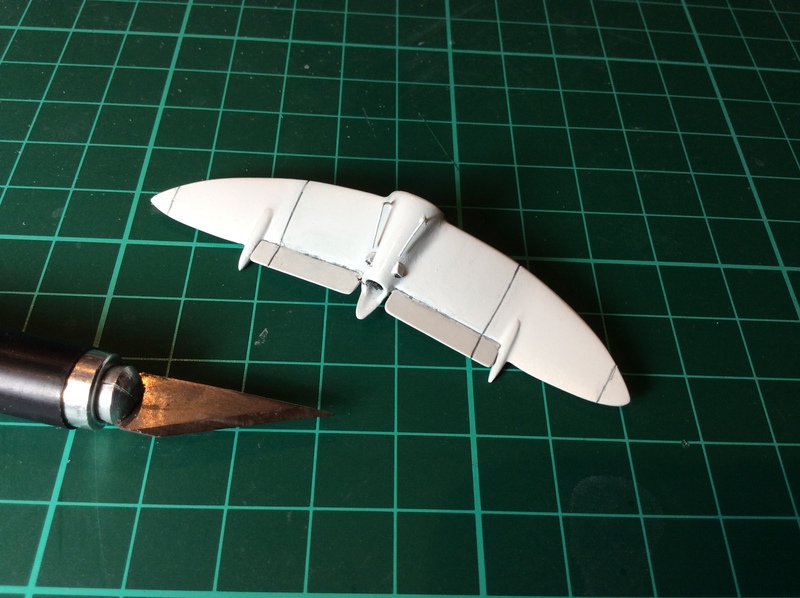 The Mehve powered glider from Nausicaa of the Valley of the Wind - using a pair of unknown wings I scavenged from a spares box in a store in Tokyo, although I discovered my scale reference was off and it was actually 1/48. 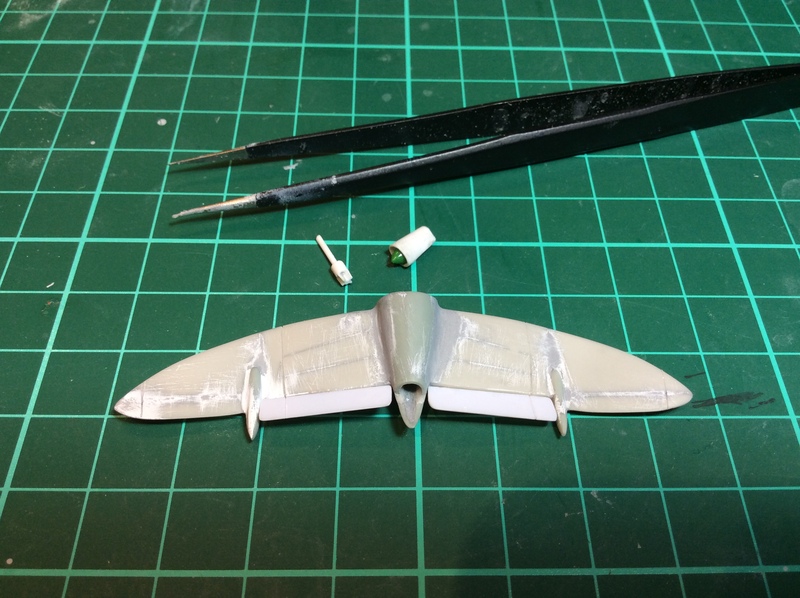 So a true 1/72 one is back on the bench, this time using the wings from that 1/100 Komet. 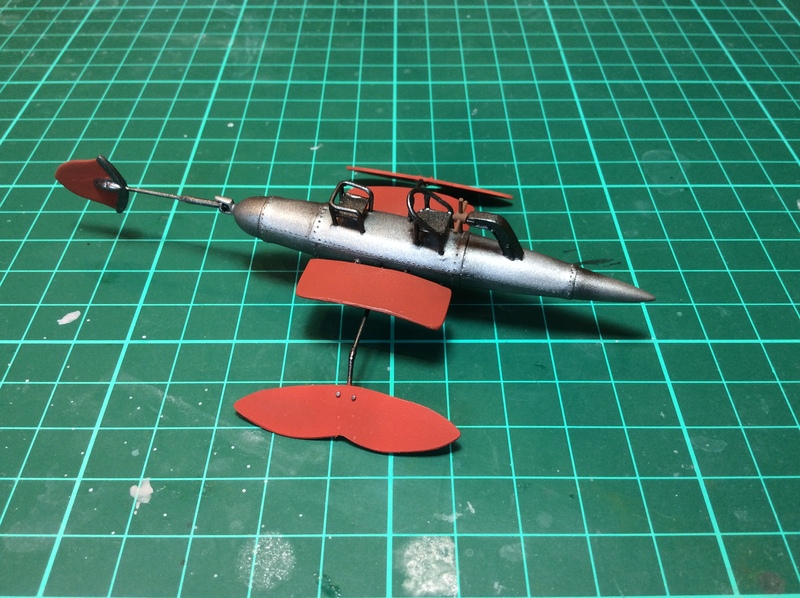 Fujimoto's submarine from Ponyo on the Cliff by the Sea - mostly using the hull from a 1/350 Cutty Sark. 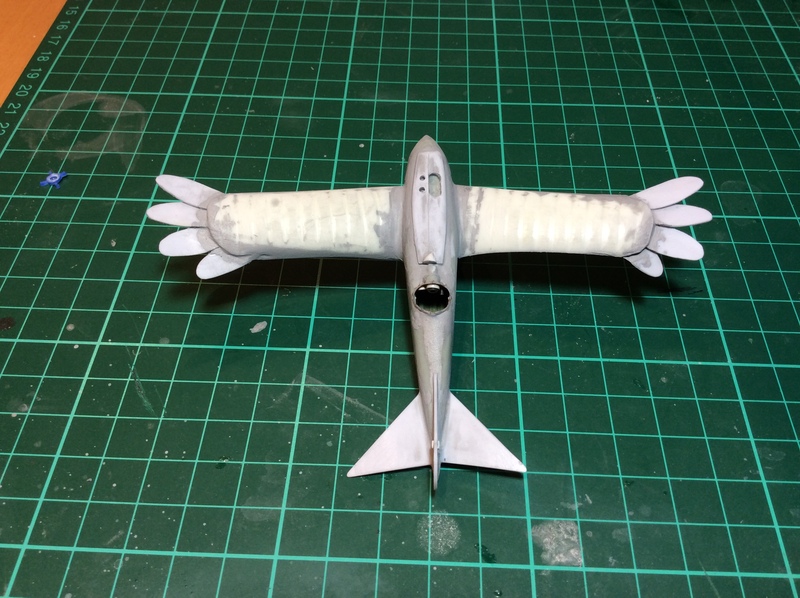 The Aero-Kayak from Howl's Moving Castle - basically formed from the drop tank of a 1/72 MiG-21. 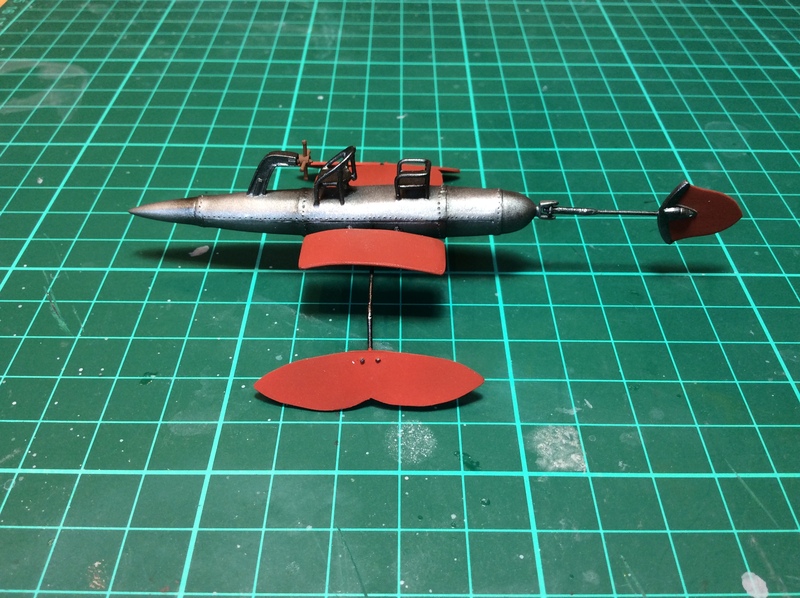 Jiro's "Bird Plane" from The Wind Rises - from another Spad XIII fuselage, he nose cap from the same MiG-21 and wings from the left-over sails from the Cutty Sark. 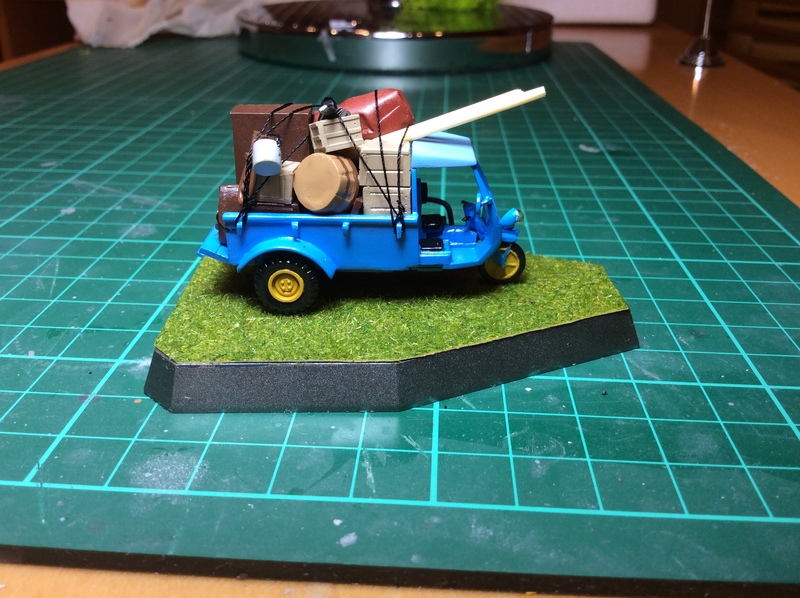 The Dora Gang's Car from Laputa: Castle in the Sky - using nothing but styrene bits (probably a steering wheel left over from that 1/72 Willis Jeep). 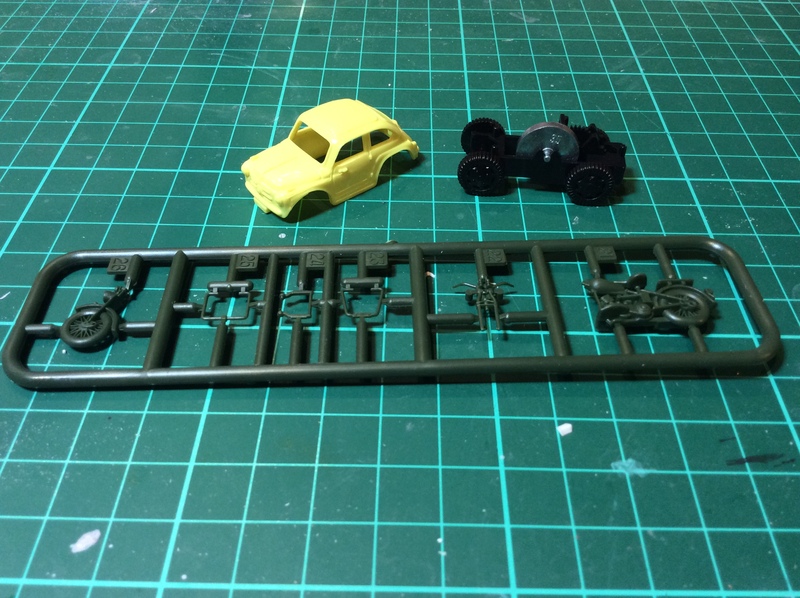 I'm also planning to scratch build the Little yellow Fiat 500 from Lupin III - The Castle of Cagliostro using the chassis from the aforementioned Kübelwagen. I'm still trying to figure out the best way to approximate the curved frame. Any suggestions would be welcome. 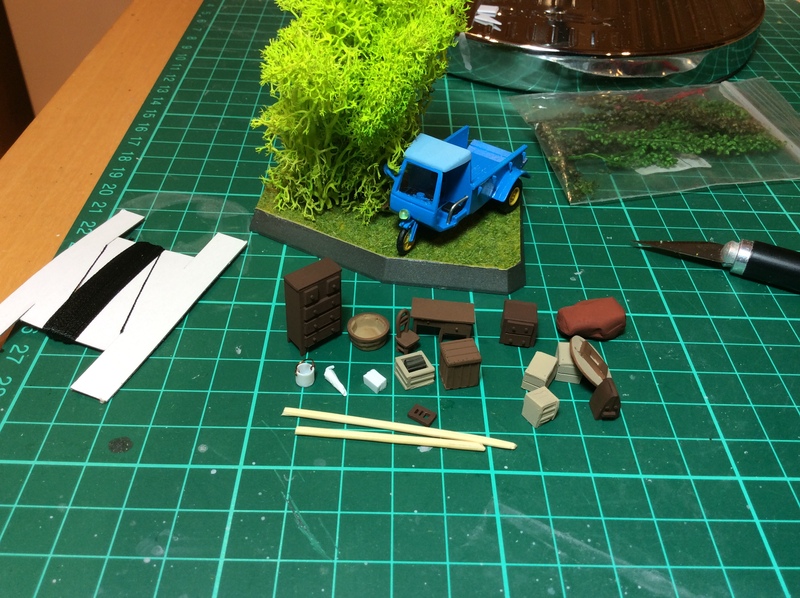 Just about finished crafting some "stuff" to go in the back of the Totoro mini-truck. I wasn't planning on building a bunch of furniture, but after an online nudge, I agree... it's missing something without it. 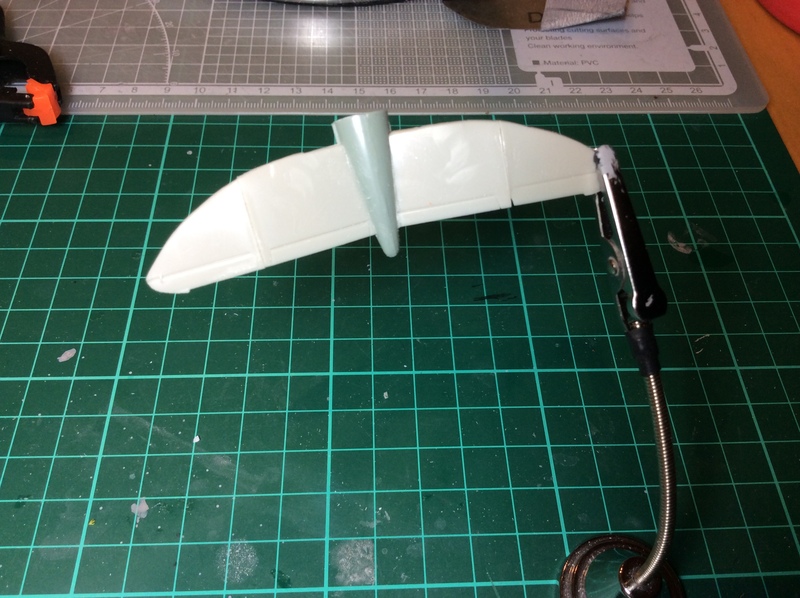 In between making tiny desk drawers, I was able to make some progress on Jiro's bird-plane from The Wind Rises. 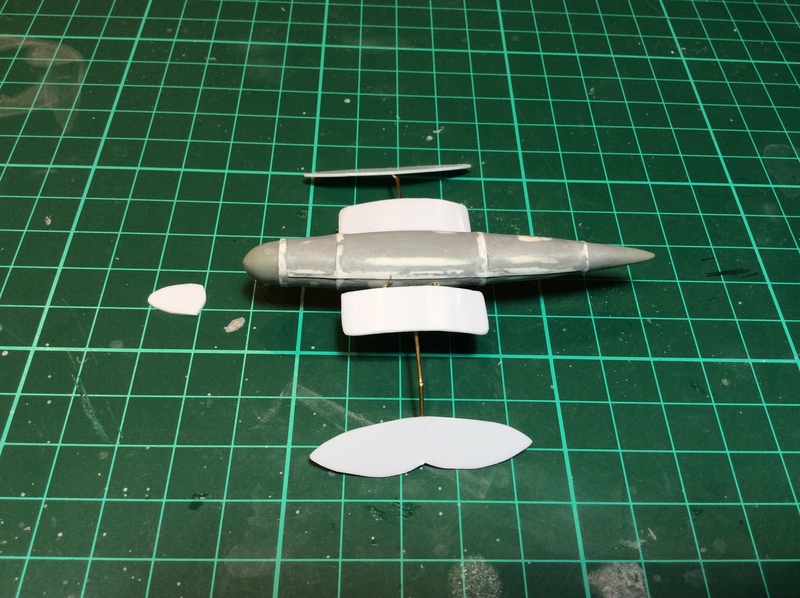 Finally, things are coming along for my Aero-Kayak (How's Moving Castle). 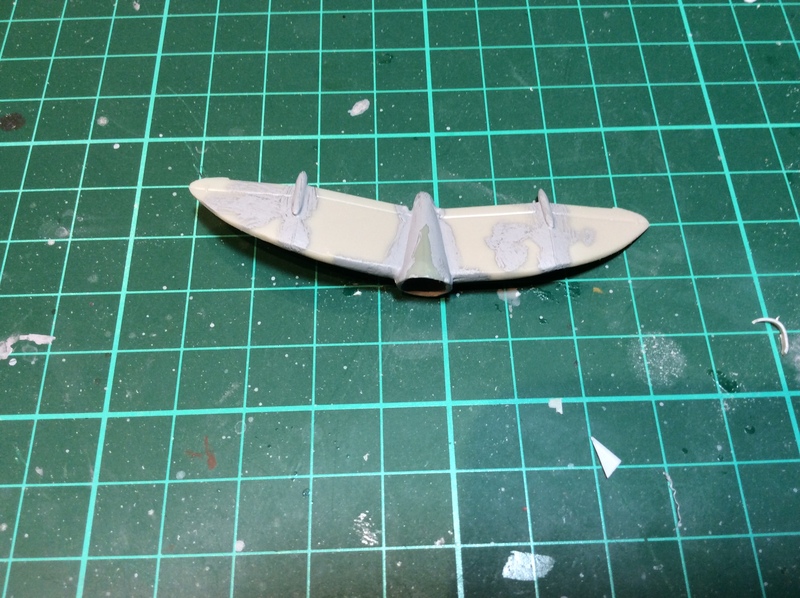 I used strips of thin styrene putty and sanded on one side to simulate the panel lines. 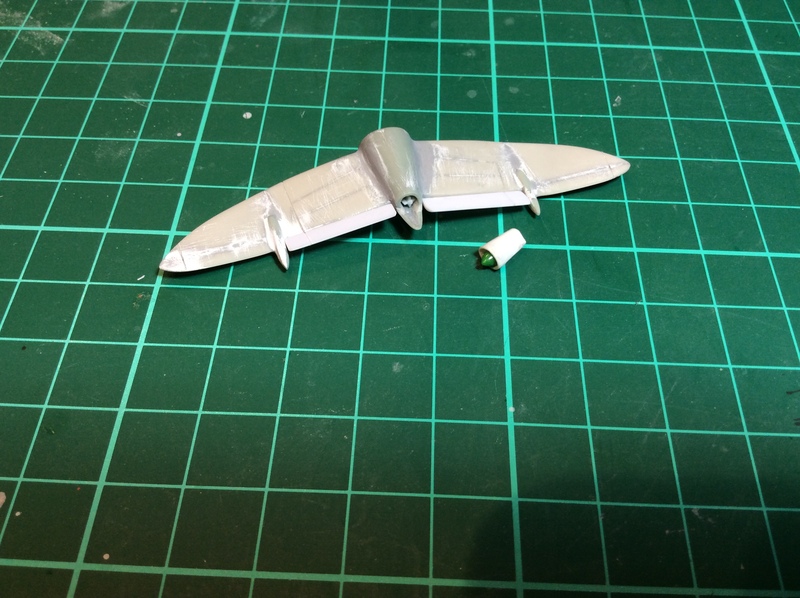 Then I used some brass to start building the spindly wings. Welcome to the BTS forums! The links you shared are incomplete and open up a 404 page. It would appear that the links you intended to share were truncated/cut off in some way after you posted your topic. Whoops! Not sure what happened there, but I think I fixed all the broken links. I was able to re-stack up all the various household items in the cargo bay for the mini-truck. At first I wasn't planning to create all that stuff, but I'm glad I did. It really makes the model pop and make it look like the truck from the film IMHO. 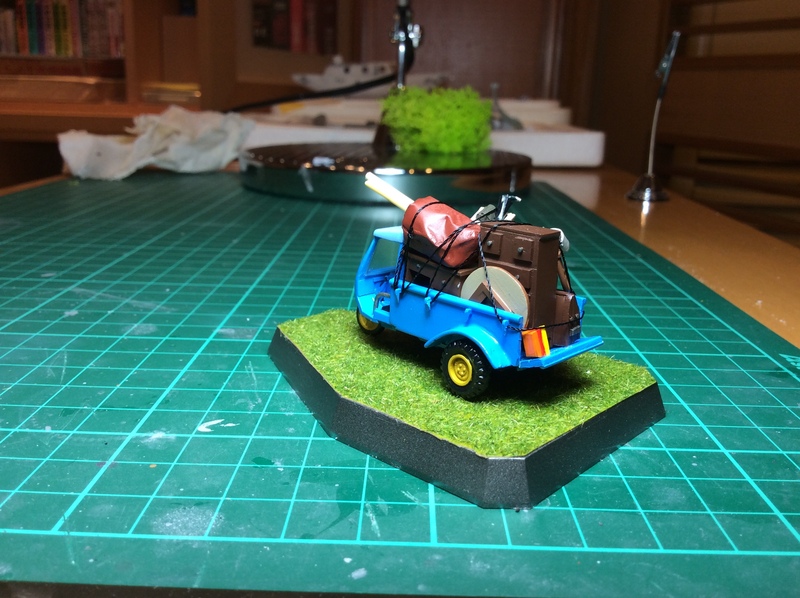 After the coat of Future dries, I'll probably give the wheels a bit of a wash to add depth, but that's basically it. Luckily they do, so I was able to finish off the interior, painted and glued in place. 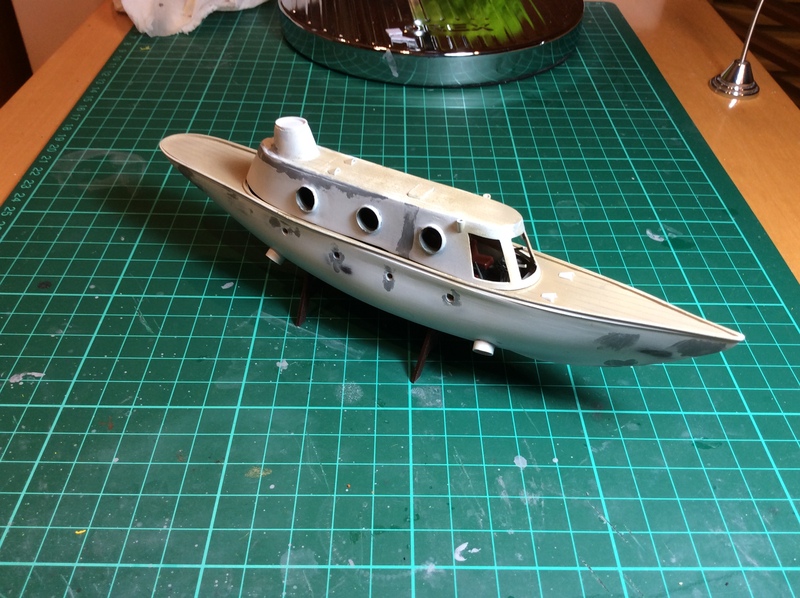 Once the clear coat dries, I'll give the interior a bit of a wash and then attached the two halves. Welcome to the boards! Quite the entrance. 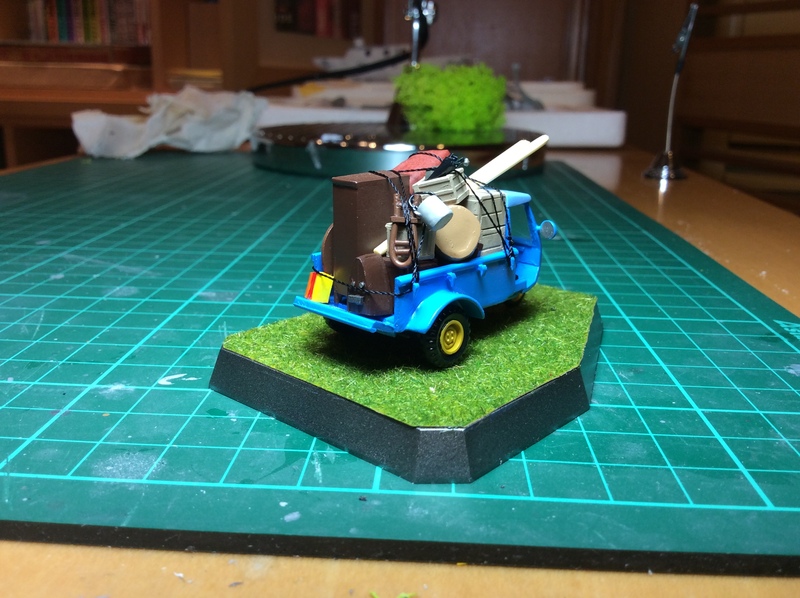 I'm a big fan of three wheeled vehicles (and of "My Neighbor Totoro") it came out great! That is one heck of an introduction! Great work, look forward to seeing more! Thanks all for the warm welcome. I figured I'd just jump in with both feet since I'm getting a very good vibe from the discussion going on around here. Obviously feedback and suggestions on my builds are always welcome. Really nice work and its great to see you posting your work here now. I am so happy I gave you some sort of inspiration with my build! 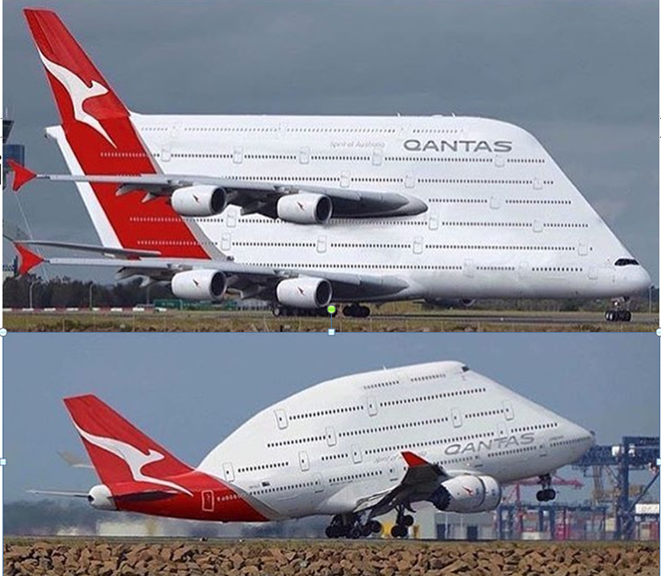 I look forward to admiring your work on the Pirate Plane! I have seen all your works so far about Miyazaki's movies and I must say you have a great fantasy and design skills. The way you reuse old pieces id fantastic, really! At the moment, I'm on a bit of a Miyazaki kick. Besides the projects I've already completed or are in the works, I have plans for a few more. One thing I've been doing with these is calling them "mystery" projects and not starting out by telling people what I'm building. 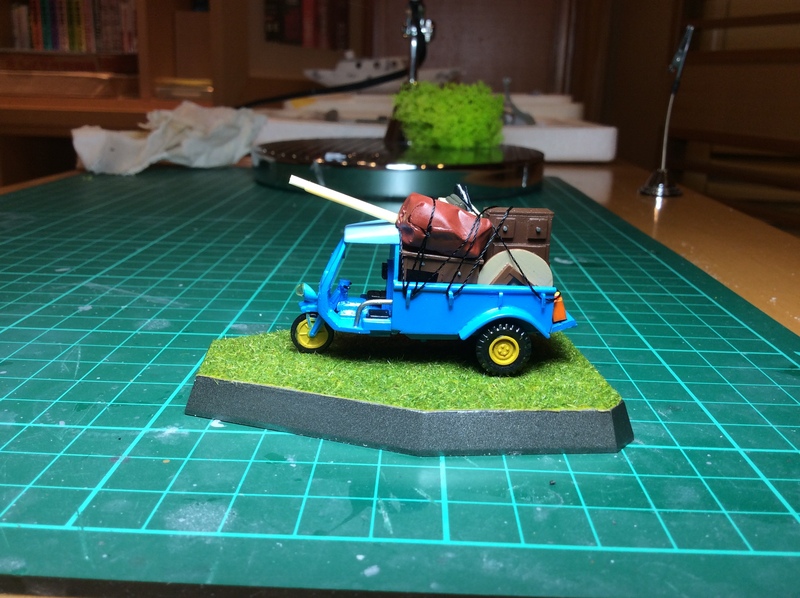 That way the Miyazaki fans can guess as it takes shape - and I know honestly if I'm doing a good job or not. Does that sound like fun? 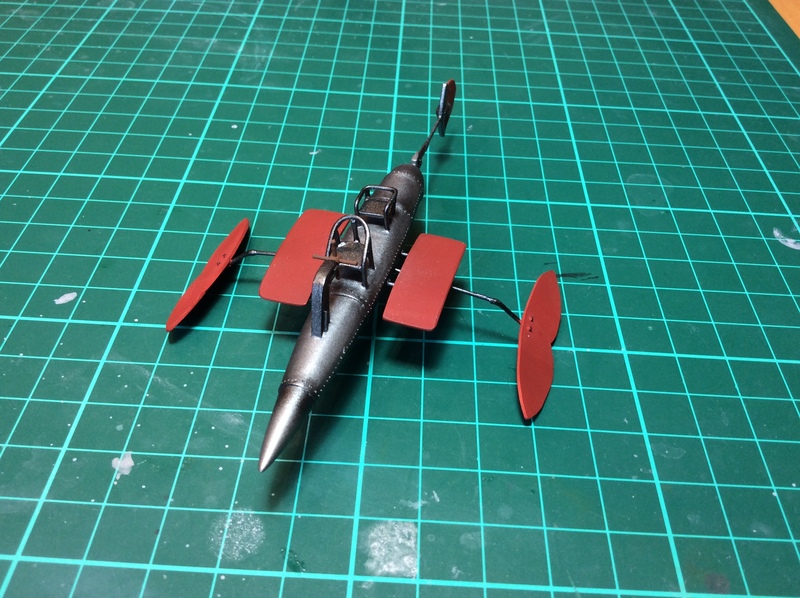 Besides following Antonio's footsteps for the Pirate Dabohaze planes, I'm also planning more or less straight OOB Porco Rosso builds for the Savoia S.21, Curtiss R3C-0 and a Macchi M.52r, all in 1/72. 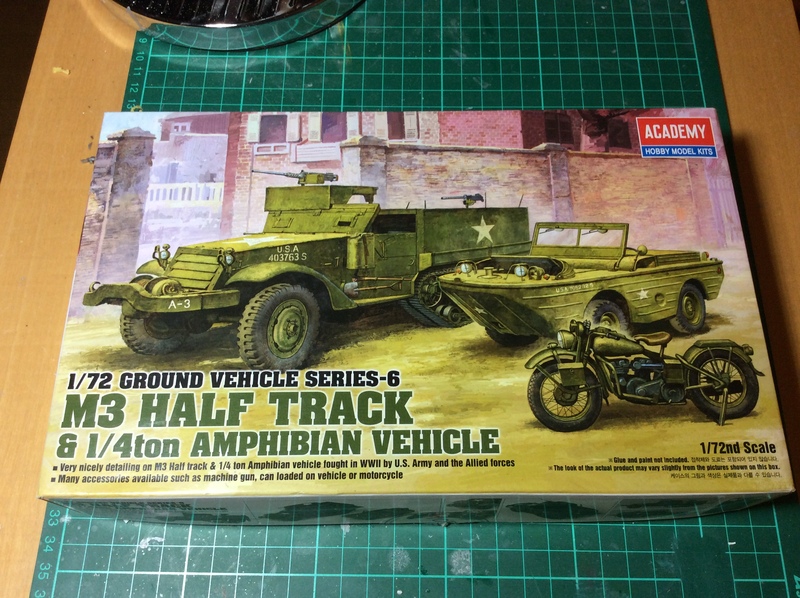 I recently got my hands on the mythical Vintage Models M.52r kit, but I noticed it doesn't come with any decals. Anyone have any suggestions where I can get the following two decals? 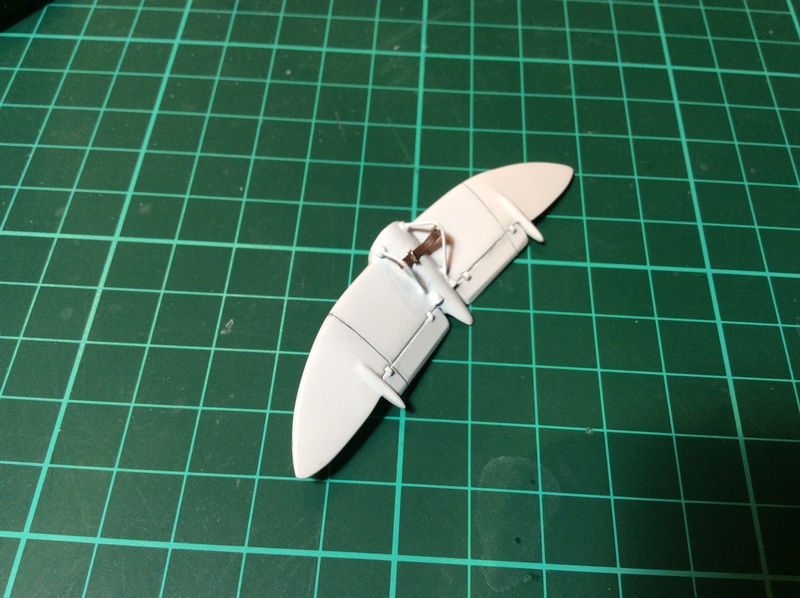 The fuselage roundel seems to come with just about ever Macchi m.202, but I'm not sure about the cross/crown on the tail. Cheaper is obviously better. 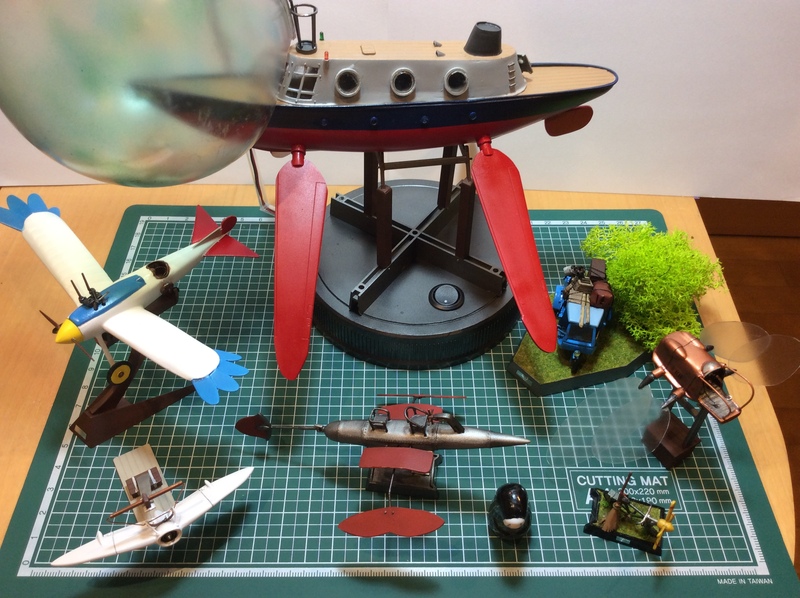 My other two "major modelling themes" are based on the manga/anime series Area 88 and Tintin. 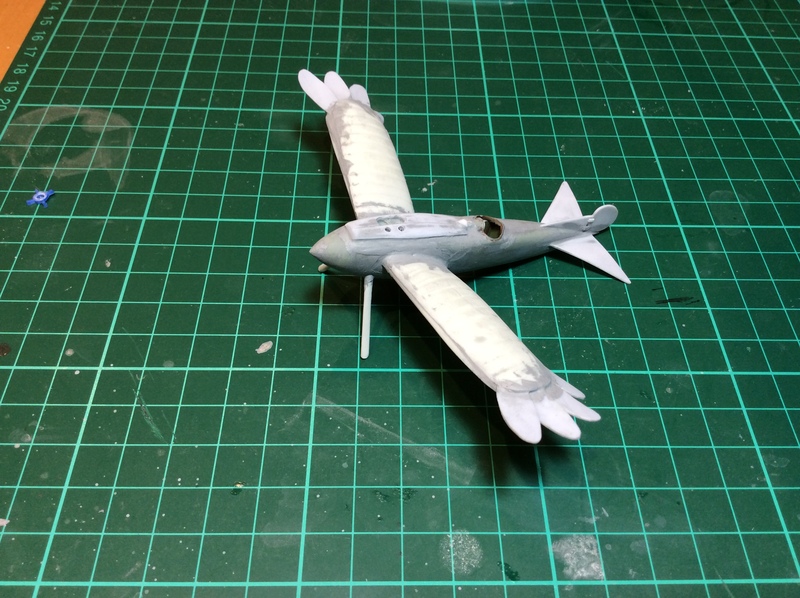 For Area 88, besides basically planning to build all the various jets that appear, I've opened it up to include a "re-imagining" of the series set just after WWII using prop planes of that era. That's extra fun because it lets me WHIF a whole bunch of prop planes. 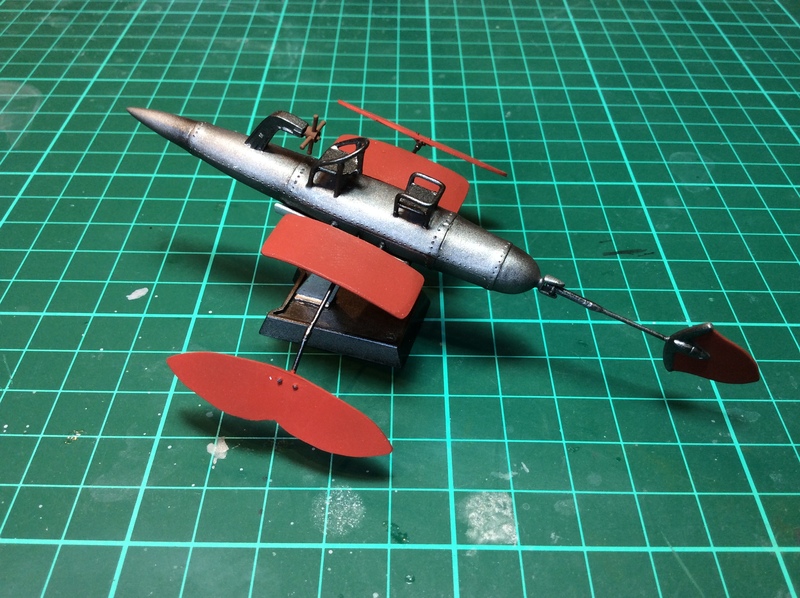 It's also a really flexible project as I basically include any other plane I want to build under the category of "What if I was one of the mercenaries...". One example of this project is available here it's my re-imagining of Shin's Vought F-8E Crusader as a Vought F4U-1 Corsair. As for Tintin. 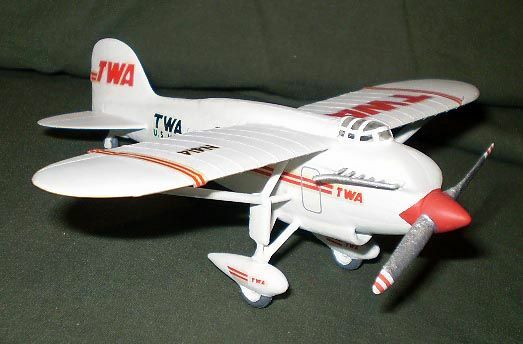 I've been mainly building some of the planes that appear in the comics (like the THC Chipmunk that appears in the Tintin adventure, The Black Island. 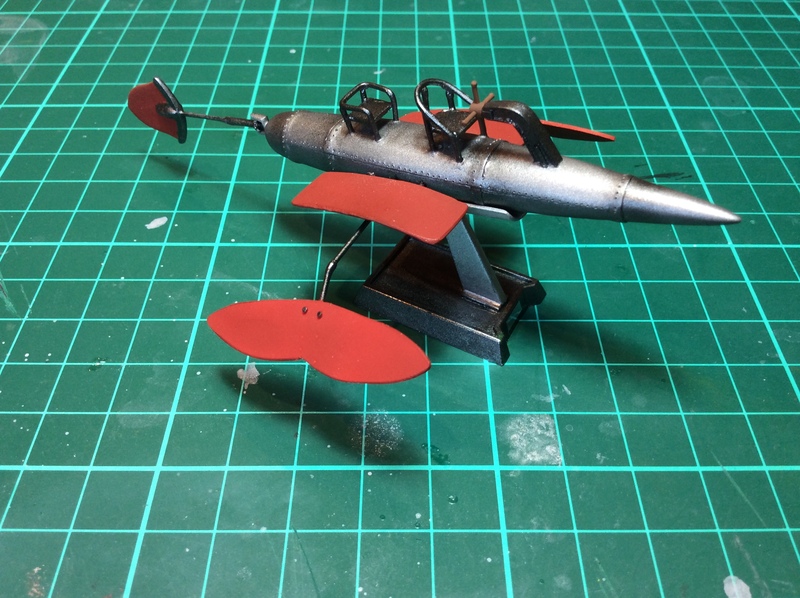 But I've also scratch built the shark submarine that appears in the Tintin adventure, Red Rackham's Treasure. 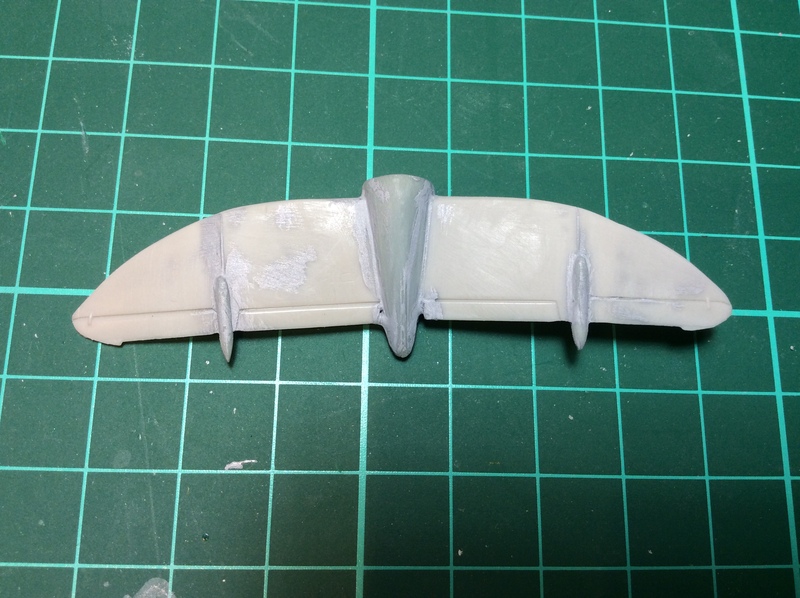 That one started with a 1/100 Me262 kit... the shape just screams "shark" to me. 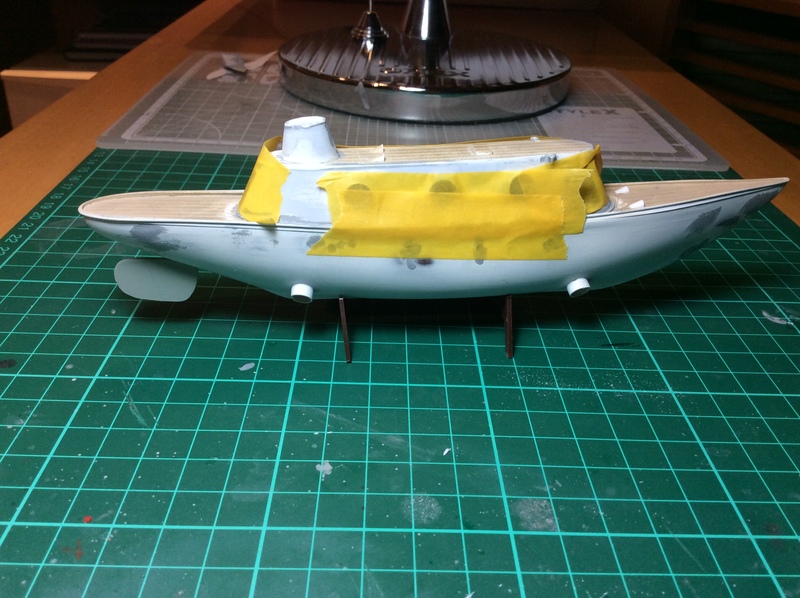 I spent most of my time tonight sanding down the submarine, so I'll spare you the PSR action pictures. 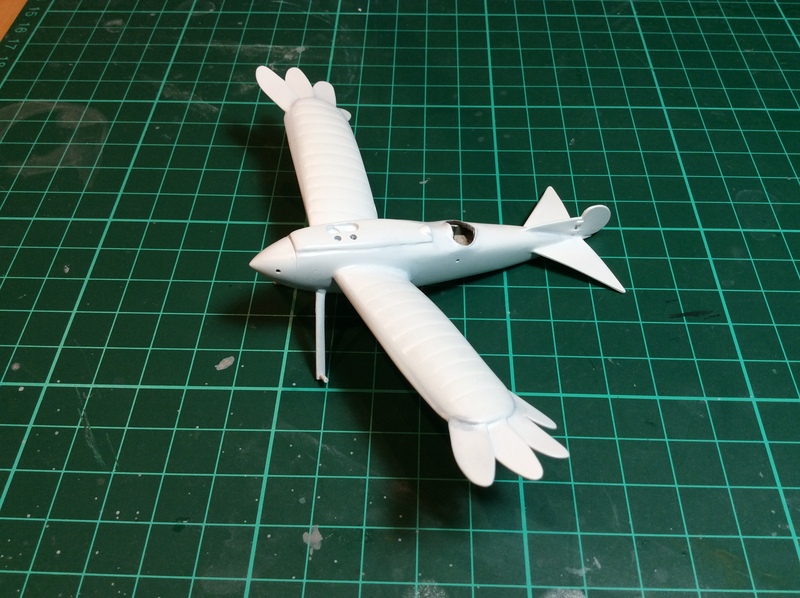 After I got it done, there was just enough time left to add a few more bits to the aero-Kayak and finally cut and glue the wings for the Nausicaa glider do-over. Area 88 is quite enjoyable and has realistic depictions of the aircraft involved (yes, F-8 Crusaders can fly with wings folded, it has been demonstrated by accident). I've got the new Hasegawa 1/72 boxing of Shin's F-20 and I may buy another to use the decals to do his F-5E in 1/72. 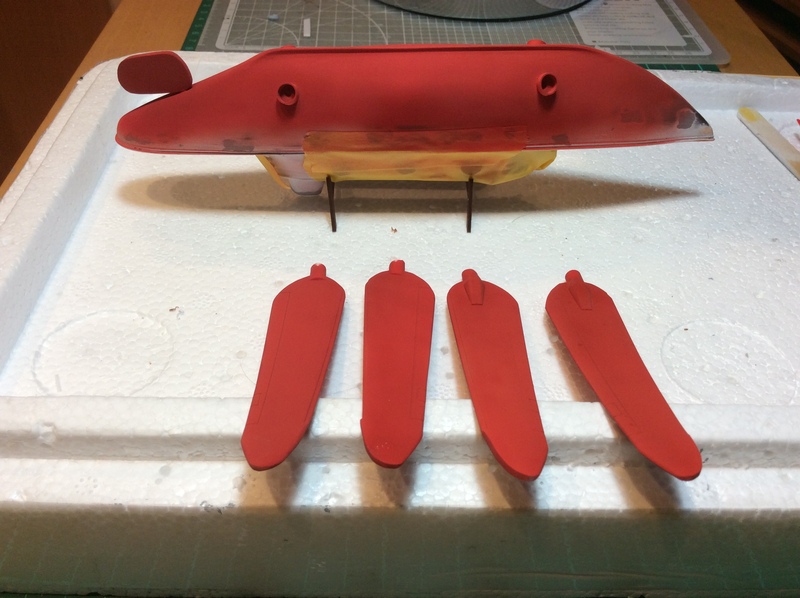 I've also acquired, off eBay, decals for his J-35 in 1/72 as well as decals for his F-5E in 1/48 (second set will be used for doing his F-20 in 1/48 from the Monogram kit). 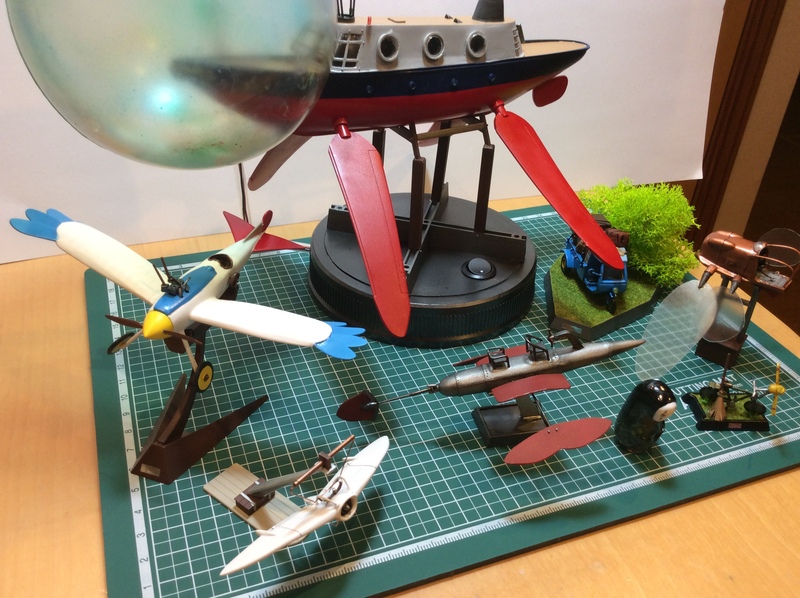 I've got both Shina F-20 and Saki's KFIR in the latest creator works boxing. The nice thing is that the F-20 decals include 3 Flaming unicorn head crests, which is all you need to craft either the F-5E as well as the J-35J Draken. 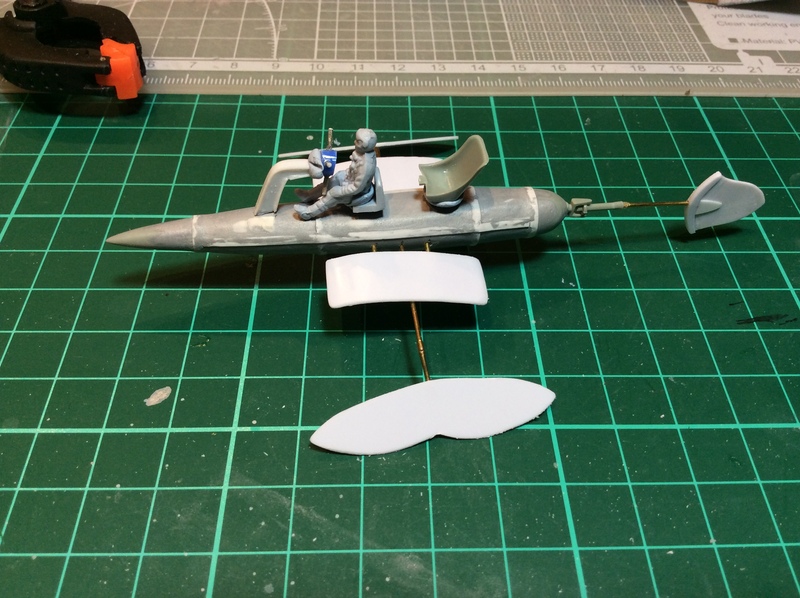 The "squashed" one goes on the Draken, and the rest of the paint jobs on both those planes are in the "reasonably possible" level to achieve with masking. Saki's KFIR also comes with the decal you'd need for the B-1 bomber as well, and I'm guessing between the F-20 and the upcoming X-29 release, you'll be good for decals for Shin (although you still need the shark teeth for the F-8E). 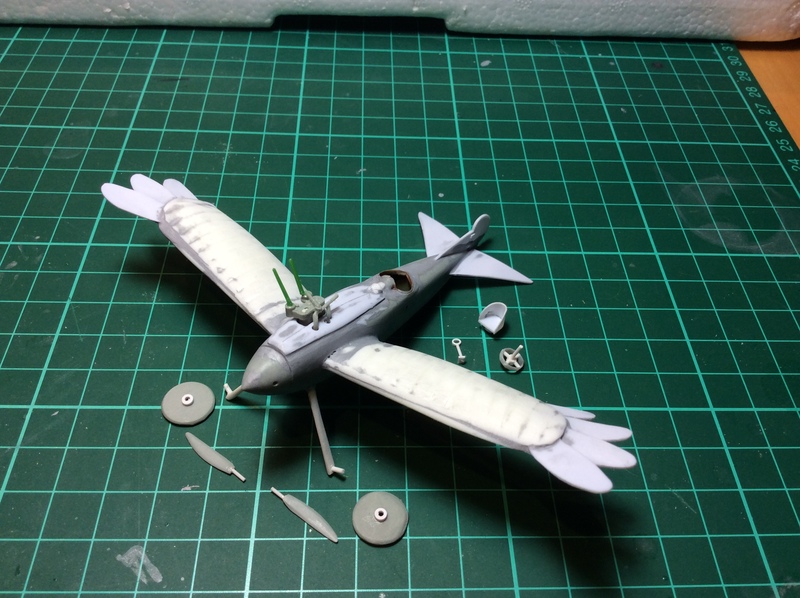 First up... scratched up the engine for Jiro's bird plane. 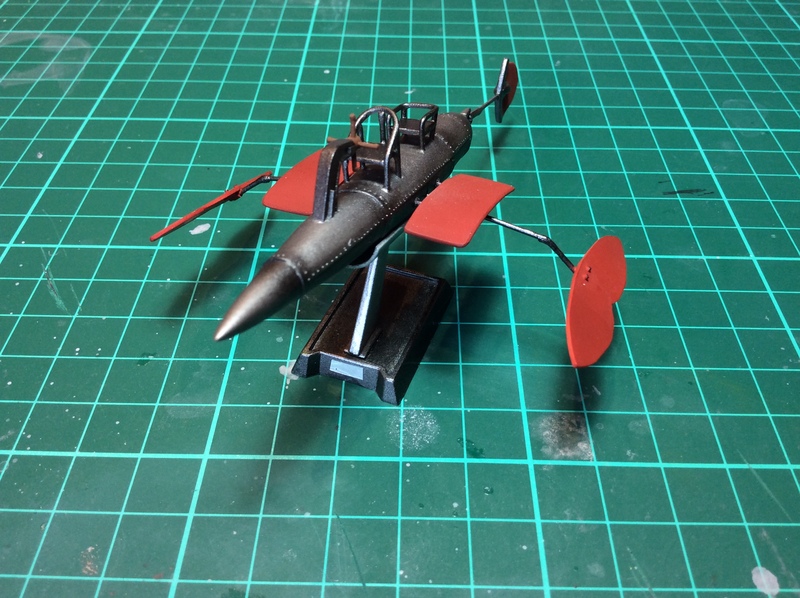 I used the leftover engine from the kit I bashed the mini-truck from and added a few bits from a Space Battleship Yamato kit and my favourite Spad XIII. I also sawed a MiG-21's wheel in half to get two and then I scratched up the steering wheel outta basically nothing. 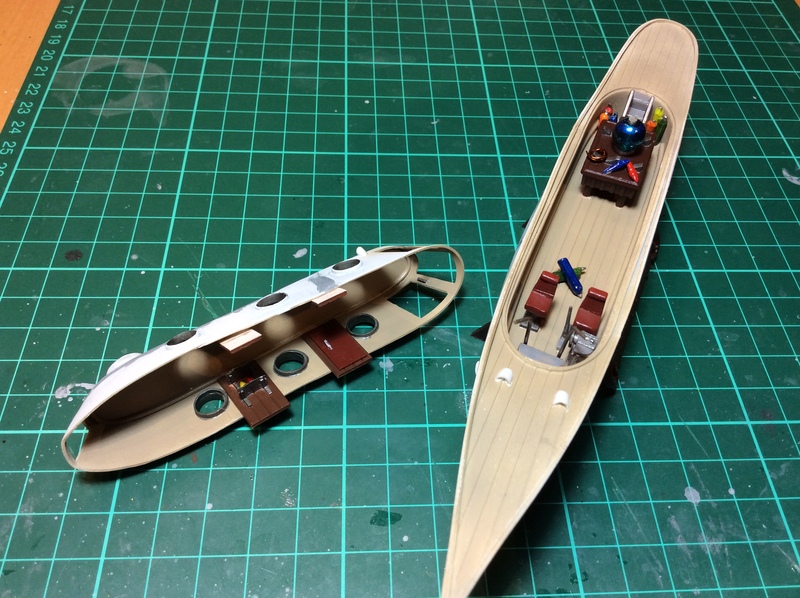 For the Aero-Kayak, I mainly added details to the "flappy wing things" and created the steering column and wheel. For the Ponyo submarine... I've got the first coats of paint done and you can start to see how this is going to look. Still more painting to be done. Wow you've made some wonderful progress, strobez! I really like the look of that sub and the plane reminds me a little of a German W.W. I Taube. 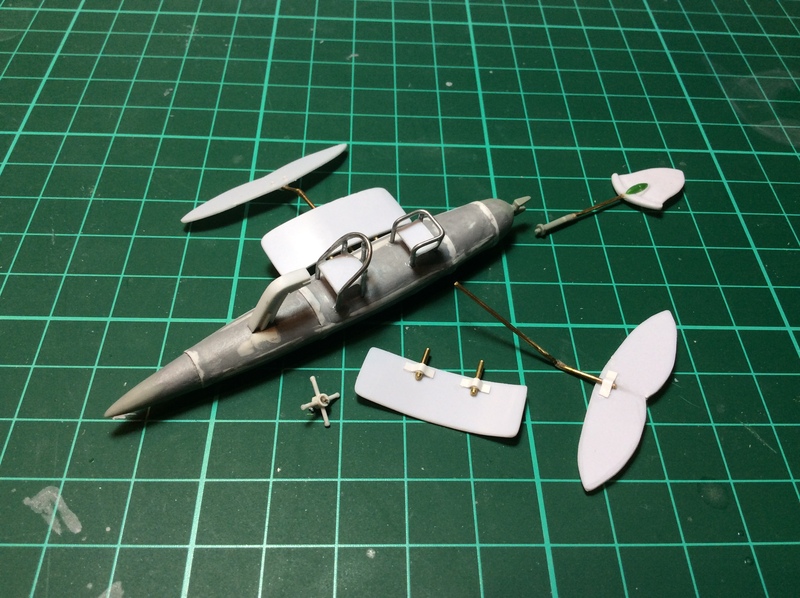 You can get, off ebay, 1/72 Draken decals for his aircraft. I've pre-ordered the X-29 release (I do want to see if it includes pylons and missiles). The only problem I have is that it has the flight test instrumentation boom and not something an operational aircraft would have; it just might be a candidate for the radar nose from a "platypus" F-5E or replace from the canted builkhead just aft of the cockpit forward with equivalent F-20 bits and pieces. 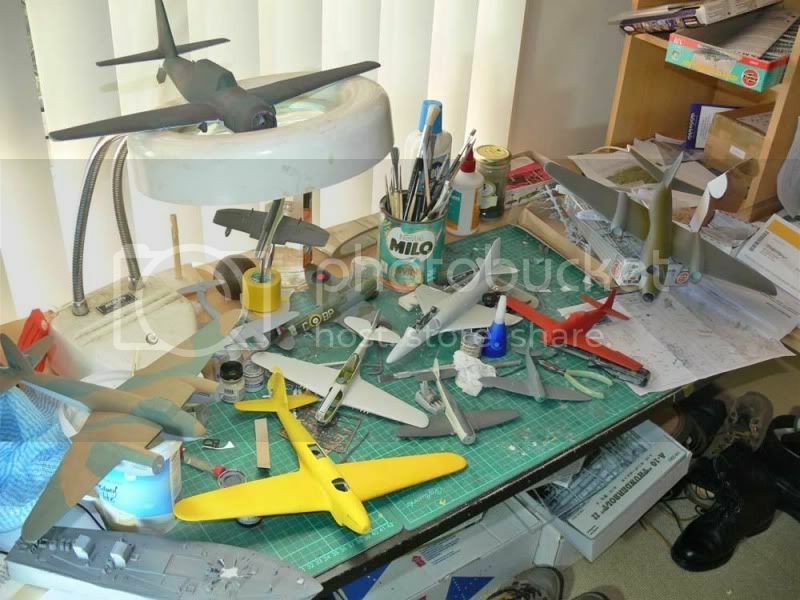 If you do the decals for Shin's F-8 in 1/72, I'd definitely be interested. Switching gears while it was drying, i got to work on the Nausicaa Mehve do-over. I cut new slats and glued them on at a bit of an angle. 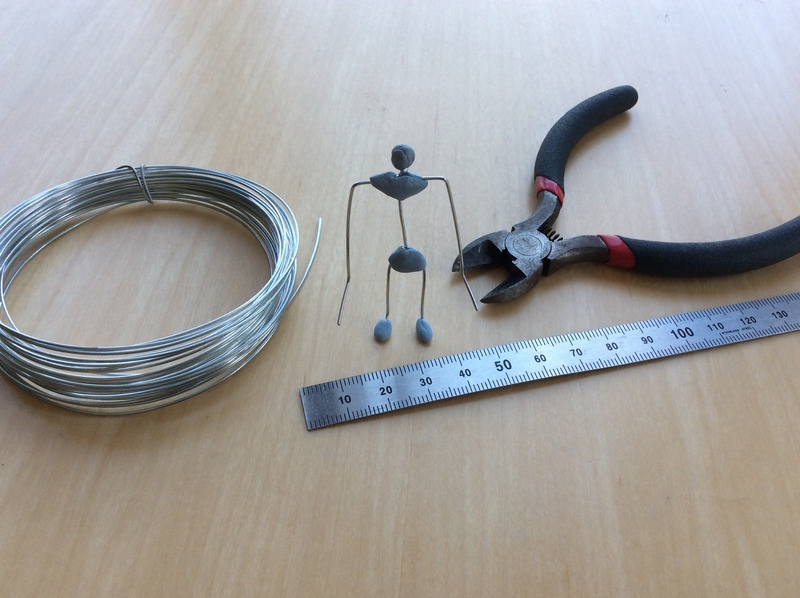 I wanted to attach them with a bit of wire, but even my tiniest drill bit was too big for the job. I also scratched together a tiny little engine out of some odds and ends. 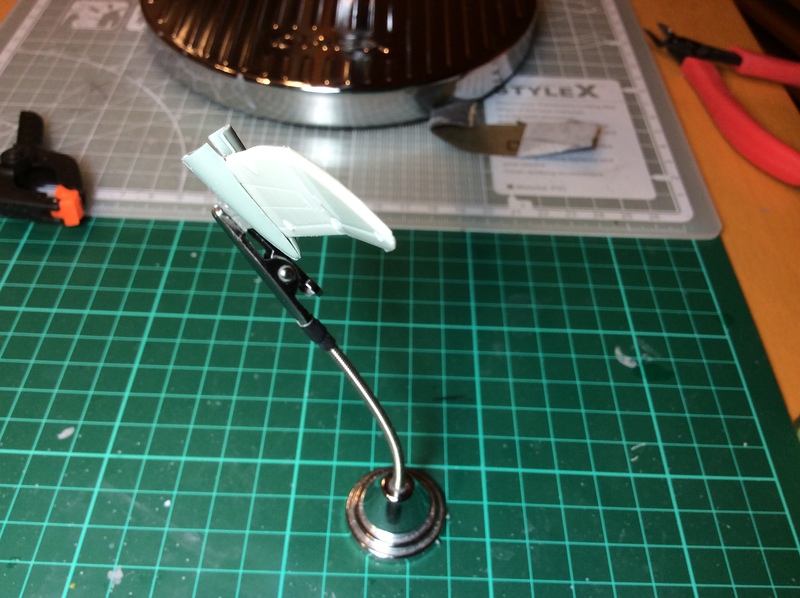 I'll have to place the front in carefully so that it sits straight. Me too. I thought about including the bus they're waiting for in my build... still might. 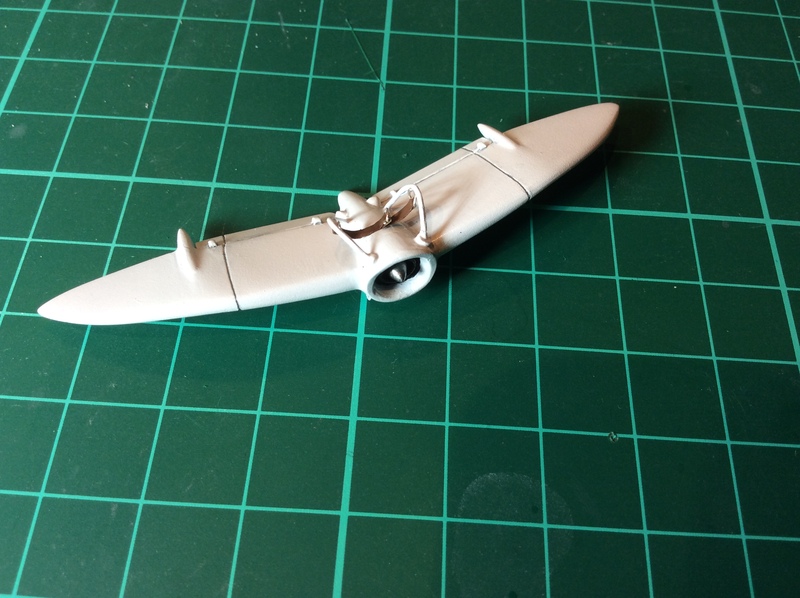 Anyway, last night I put the finishing touches on the Aero-Kayak from Howl's Moving Castle. 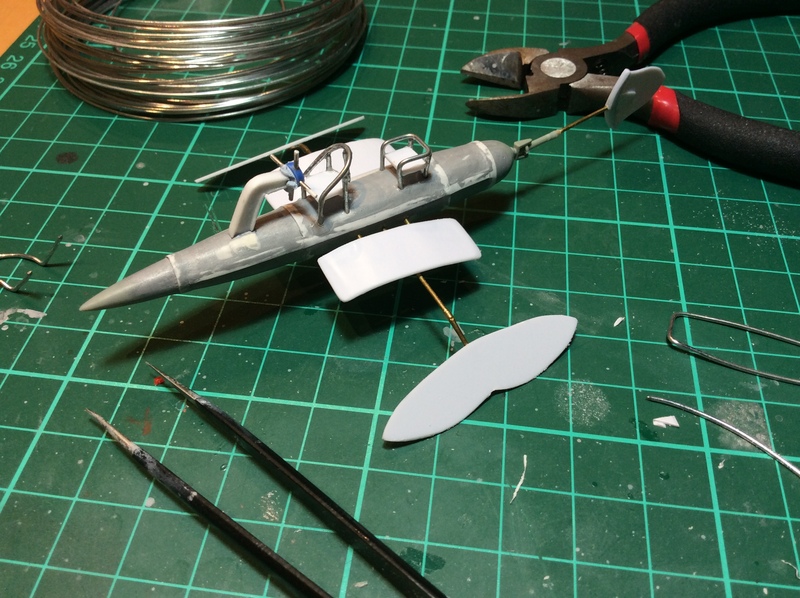 I find that it's become a bit of a race between several of the mini-projects as they near fruition. As it becomes clear which one is going to be the "winner", I slowly set aside the other WIP builds and focus on getting the chosen one over the finish line. That helps with making sure I don't forget any of the final touch details. 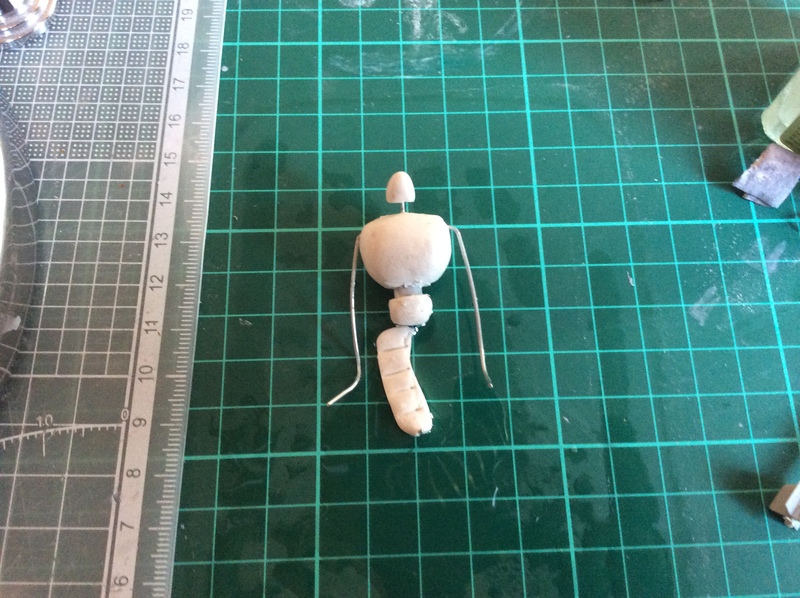 Luckily, given that I'm redoing the Mehve from Nausicaa, I gave the stand I built for it the first time over to the Laputa Flapter. It seemed a better fit, so I was able to just repurpose the original Flapter stand for the Aero-Kayak with very little modification. I basically just snapped the end off and touched up the paint. Despite the u-turn for a scale adjustment in the middle of this build, I'm quite happy with the result. The paint was a bit darker than I was aiming for, but not enough for me to want to redo it. 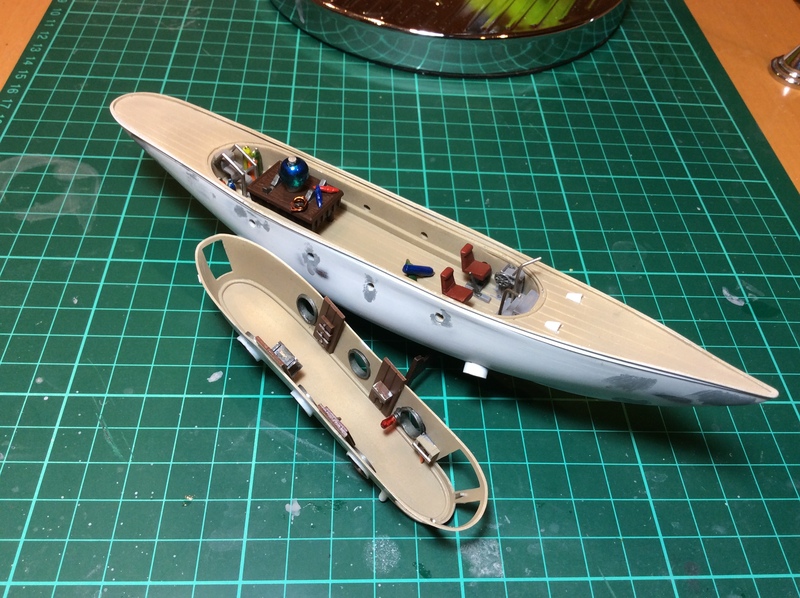 I also might have toned down the rivets, but once you start putting them at 1mm intervals, you're pretty much committed. 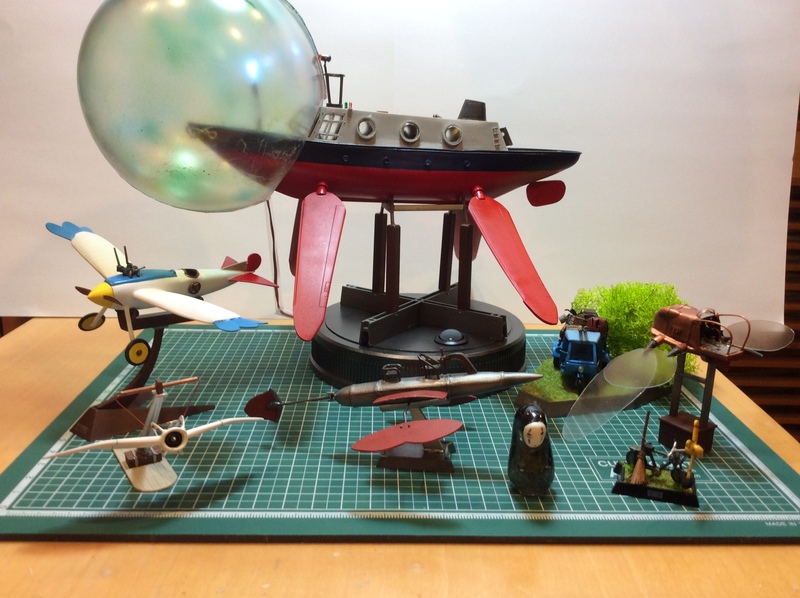 As I predicted, the Nausicaa Mehve was the next to cross the finish line (although I'm still working on the stand). It was a bit of work, but in the end, I'm glad I did a do-over on this one. It's iconic to Miyazaki fans, and a central showpiece in my growing collection of mini-builds. Besides a bit of shading on the paint job, the only thing really new was the "seat" belt. I used a bit of tape and some silver wire to get that job done. I was feeling reckless (and the tape was a bit too long) so I added a buckle too. The bottom vents are just solid and painted. I tried all sorts of things to create a vent-like shape, but it was just to small. 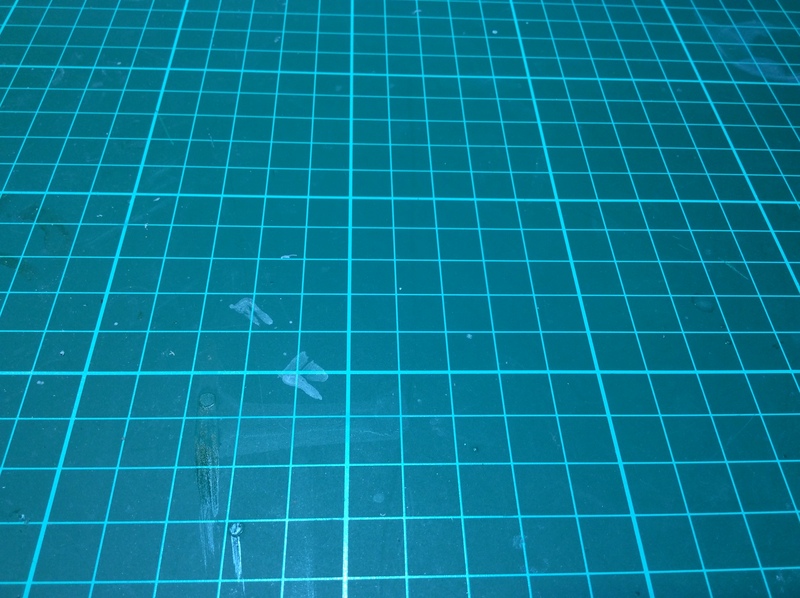 I was able to origami up some plastic paper, but it was so thin that even a tiny amount of glue would make it melt. Oh, well. You can't really tell anyway... right!? At least I got the engine to sit straight without reducing everything into a gluey mess while trying to wrestle it into place. ...and then pulled out the motorcycle sprue and plunked it down next to the eBay arrival. 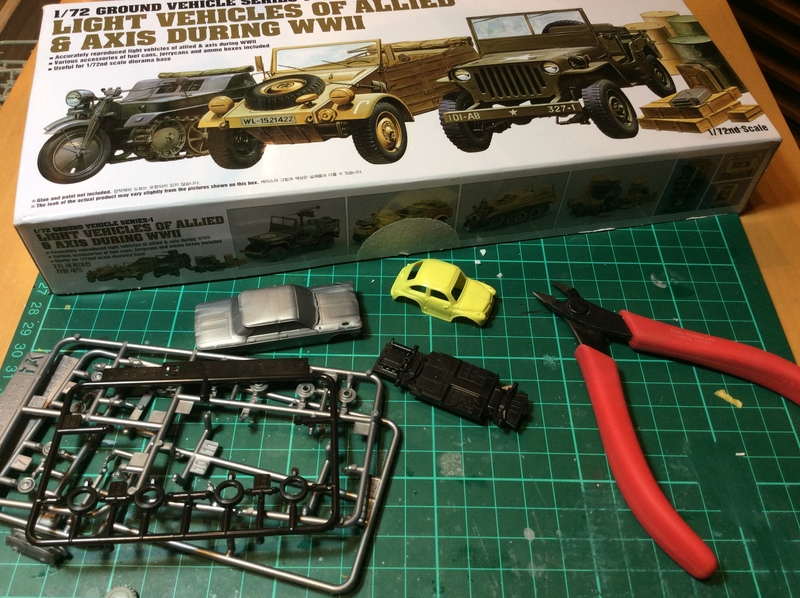 I originally bought the kit just for the motorcycle bits, intended for my Totoro mini-truck, but when I saw the sprue I didn't have the heart to chop it up. Luckily I had an idea to use it for it's intended purpose - building a motorcycle! What arrived from eBay was a 1/72 scale (and spot on I might add!) Fiat 500. It's supposed to be a throw-away "pull back" toy from the 1970s/80s I think. Regardless, the moulding is quite finely detailed, so for $3 I had o have it. 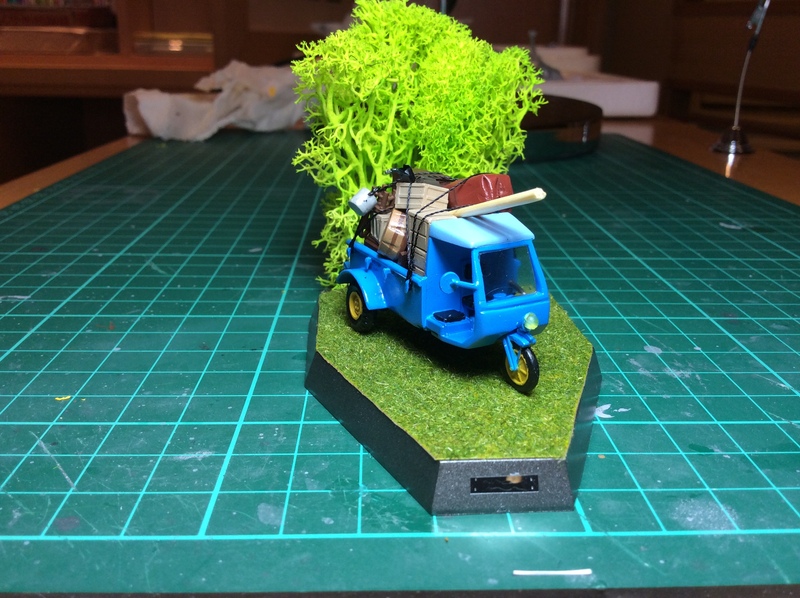 It solved my problem of how to scratchbuild a Fiat 500 in 1/72 nearly perfectly. 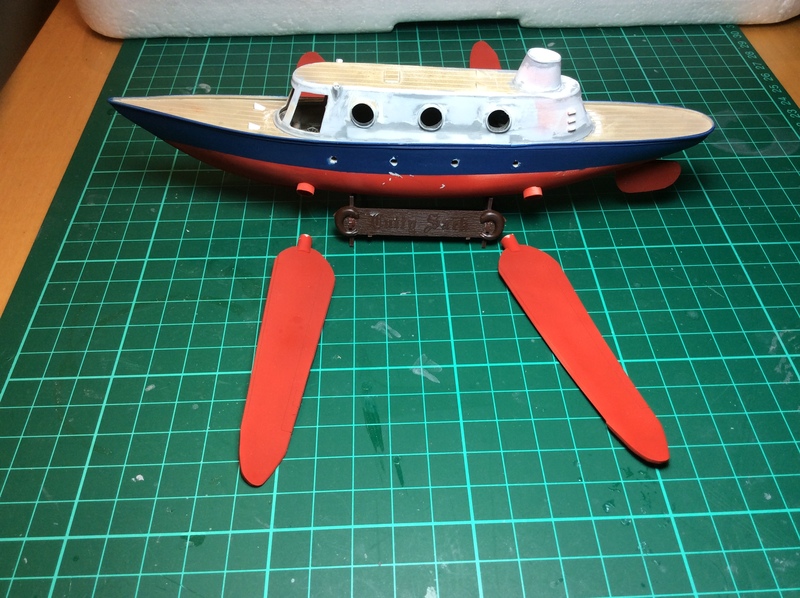 The ONLY tiny problem is that the doors are backwards on this model, so I'm debating if I want to try and remove the handle/hinge and swap them or not. 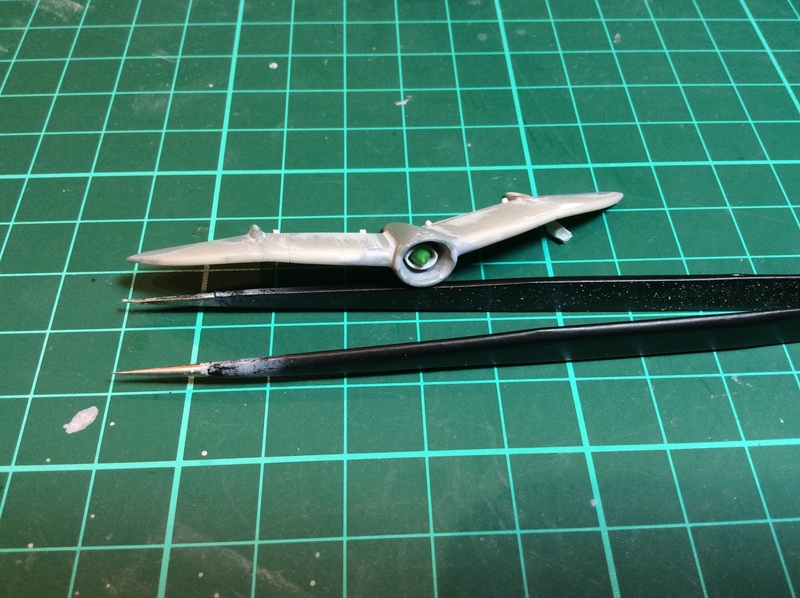 I also happened to have stumbled across a small snap kit from Bandai that's helpful. 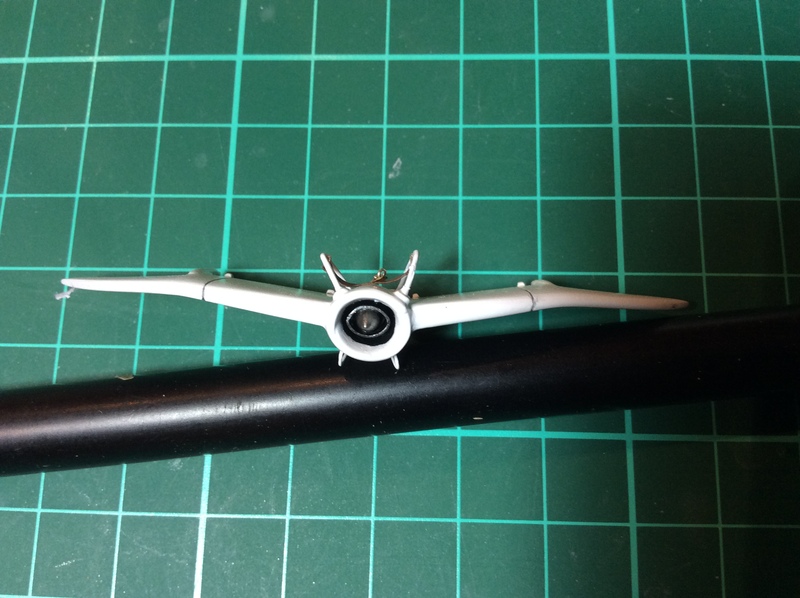 The kit is originally from the Ultraman series, but I thought I might be able to use the wheels from it. 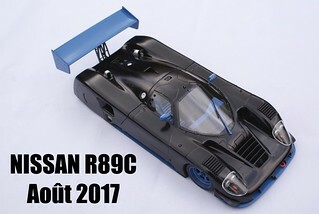 I certainly can, and even though the upper body is basically solid (with stickers for windows), the bonus was the chassis. 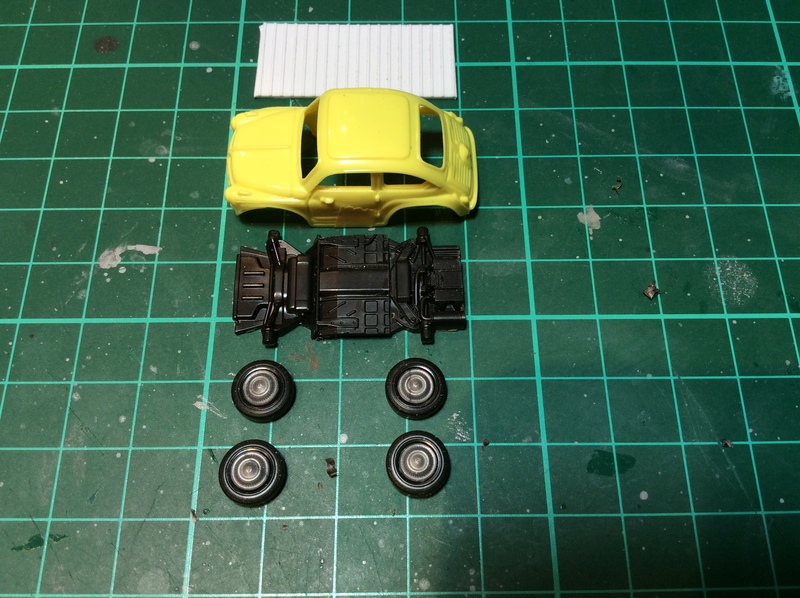 Obviously too long and a bit too wide, but snip snip glue glue... and we have a top, a bottom and four wheels... I call that a car! Now the only question, dear friends... is which car? Hallo Greg, fantastic work as usual! Your creations are highly realistic. Well done strobez ! - No Face and the frogman from Spirited Away. The frogman might be hard to spot because he's... inside No Face. It was just a fun little resin casting project involving a bit of crystal resin, some black paint, a 1/150 figure and a bit of epoxy putty frog makeup. Of course, seconds after taking these pics, I knocked the Laputa Flapter off the edge. 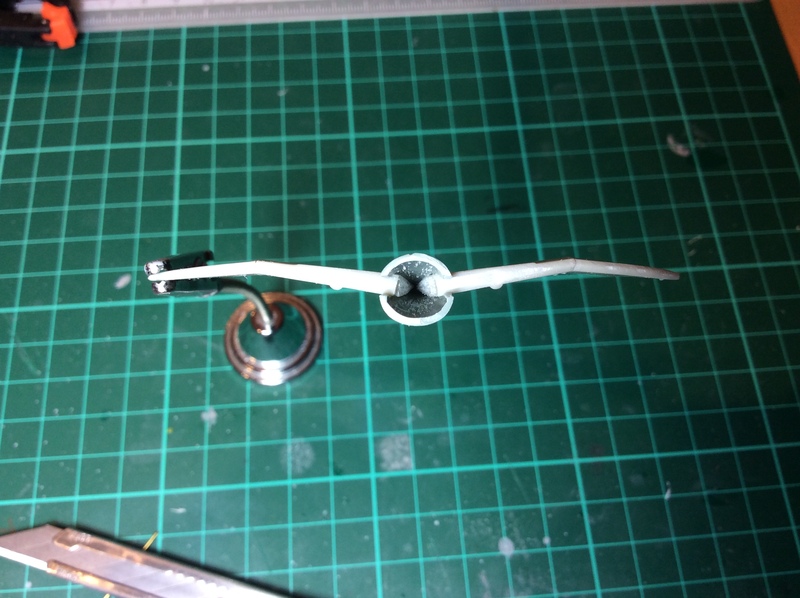 Luckily a bit of CA glue was all that was needed to reattach one of the wings and half the seat belt. Whew! I've heard of most of these animes but I've never seen most of them. However, despite that, this is a fun group of little models. Well done, strobez! Beautifully executed! That's fantastic strobez,great subjects and beautifully built! I'm not a huge anime fan - I was introduced to anime by my wife - but Spirited Away is one of my favorites.